Uchu IPA is 7% American IPA from Uchu Brewing, based in Hokuto city, in Yamanashi, Japan. It’s part of their all-year round range and can be found in bottles and on tap. Uchu IPA is brewed using Golden Promise, Caramalt, and Melanoidin along with Mosaic hops, and fermented with Vermont Ale yeast – sourced from a certain NW double IPA – I wonder which one it could be? Uchu IPA was drunk hot on the heels of some other Uchu Brewing beers I was drinking for a Patreon TBT video (something we do every month to introduce some styles or breweries from Japan) and I have to admit – I did not think it was going to be as good as the Uchu Big Bang IPA. Uchu IPA was as fresh as it could have been when found in a bottle – it had only be bottled one week before! It poured out a hazy golden orange brown colour with a small amount of pure white head on top. There was lashings of peaches, passion fruit, oranges – almost a watered down version of the Big Bang IPA it seemed. Some hints of juiciness (I really hate that word) came through, with some semblance of malt sweetness, but it’s the Mosaic hops on show with Uchu IPA. The initial bitterness was quite a quick after the Fresh Hop Rye IPA, but Uchu IPA’s lingered longer and was more lasting. The hops were the star of the show in this beer – fruity flavours gushed out – think tropical fruits such as peaches, passion fruit, oranges, pineapples. It’s almost as if Uchu Brewing know what they are doing. The fruits fought off each other in the aftertaste and proved to be a complex, but identifiable, bouquet in the the end. 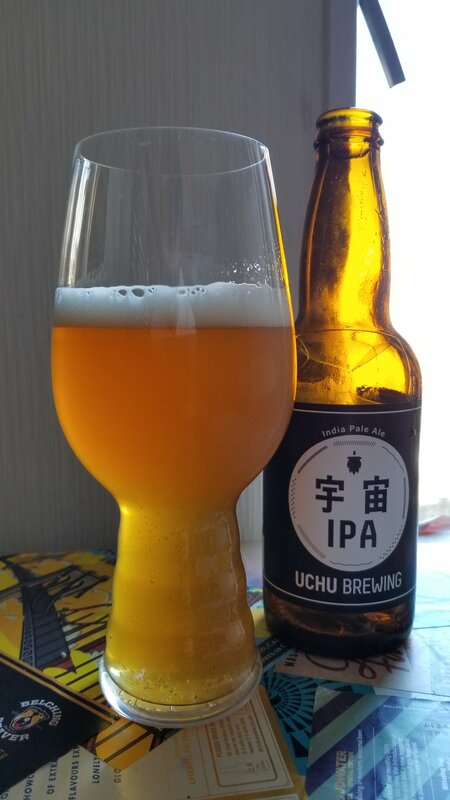 Uchu IPA is another cracking effort from Uchu Brewing.